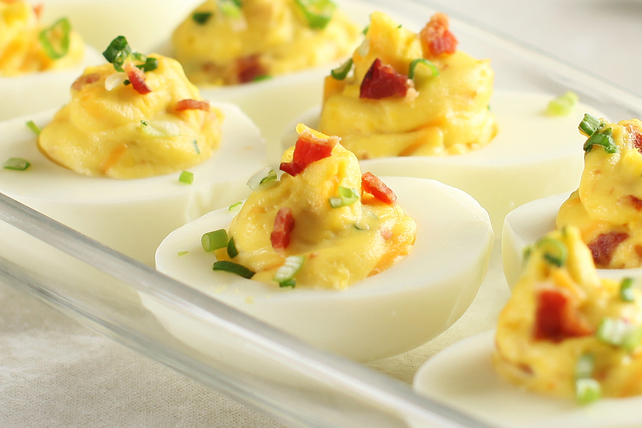 Don't forget to reserve some of those deliciously smoky bacon crumbles and finely chopped green onions to garnish these yummy Bacon-Cheddar Devilled Eggs. Reserve 1 Tbsp. each bacon and onions. Cut eggs lengthwise in half. Remove yolks; place in medium bowl. Add Miracle Whip to yolks; beat with mixer until blended. Add cheese and remaining bacon and onions; mix well. Spoon or pipe egg yolk mixture into centres of egg whites. Sprinkle with reserved bacon and onions. Substitute 1 finely chopped jalapeño pepper for the green onion.